Euro VI compliant, 2.2 tdci 125ps 6 speed manual. White and silver generally available from group stock in base and trend models, other colours available to order. 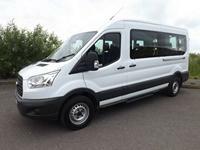 This is a perfect School Minibus vehicle for those of you who have D1 licenced drivers. Livery / sign writing is available along with nationwide delivery too, meaning Minibus World are well placed to cover your current and future School Minibus requirements. For an affordable £8.50 + VAT per day we will match you with an ideal minibus so you can see how much convenience it offers, saving you countless hours spent organising transport and potentially reducing your costs. Our Contract Hire offering means that everything is organised for you and managed on your behalf making contract hire an ideal, hassle-free way to run one or several minibuses. Typically, your agreement includes maintenance, road fund licence and MOT; you just add fuel and insurance. With a low initial outlay, fixed payments and the option to hire over 2, 3 or 5 years Contract Hire is a cost-effective option and our most popular choice.